If you check the satellite view of Cameron Village near Oberlin Road, you’ll find something mysterious. Amongst the high-rise apartment buildings, upscale boutiques, and fine dining of the bustling outdoor mall, a cryptic square of trees proves that somewhere in Cameron Village there is a somewhat sizable wooded area nestled right in the middle of everything. The first time I saw it, many years ago, I was intrigued. After all, I’ve been shopping there since childhood, and I couldn’t remember ever seeing a small forest anywhere in the area. Interesting. It seems Cameron Village hides more than one secret. 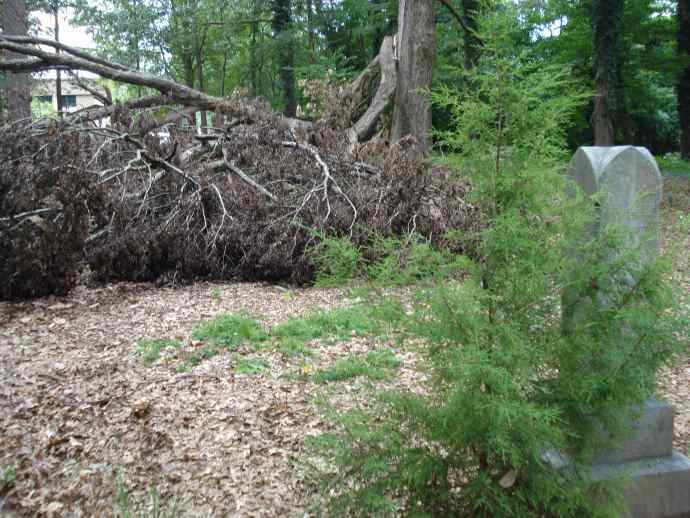 A little investigating pulled up a site that claimed an “old slave cemetery was hidden somewhere off Oberlin Road.” Fantastic. Before I continue, I just want to point out that this bit of urban exploration was years ago when I was much younger and less careful, and I do not condone climbing fences into strange, hidden cemeteries at night. Also, there’s a front entrance we didn’t know about at the time. According to the map, this odd patch of green was growing right behind the Oberlin luxury apartments, so my adventure companion and I parked there, turned south, and saw countless gnarled oaks growing wild behind black iron bars. The fence, at least twice my height, was built atop a concrete base and resembled long, cast iron spears. There was no way in. We walked along the perimeter, hoping for a weak spot. At the end of the road, the iron bars gave way to a too-tall chain link fence we didn’t feel comfortable climbing. That fence disappeared into some crazy overgrowth. At the next corner, the road turned into a quiet neighborhood, where we managed to push through some thick bushes only to find yet another fence. Why was this place so hidden? And for all we knew, the website was wrong and there was nothing in there. We scaled the fence, which was much smaller than the other two, and fought our way through some very overgrown tangles of bushes and vines. The first thing we saw was a small tent-city, where homeless people were camping. I guess it’s unlikely anyone would bother them here in this twisted secret garden, hidden right in the middle of Raleigh. We quietly moved past them, letting them sleep. Gradually the foliage cleared and we found ourselves beneath a canopy of familiar gnarled oaks. 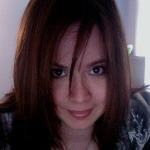 Beneath their shade, we could just make out a few crumbling headstones. 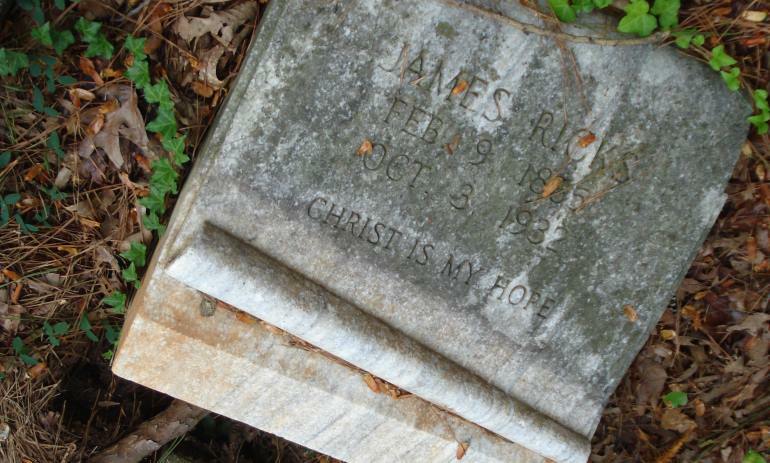 Today, the Oberlin Cemetery is still crumbling and neglected. Very few people are aware of the sad, unmarked graves, although a few news articles have been released since my visit there many years ago. 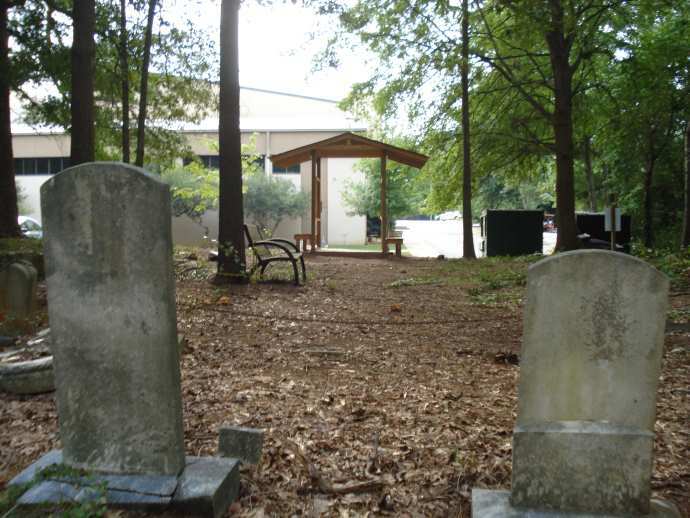 By reading Raleigh Public Record, I discovered more of the historical significance of this burial site, which isn’t so much a “slave cemetery” as a graveyard for citizens of the Oberlin Village community, which has deep roots as a neighborhood where freed people lived after the Emancipation. Make no mistake, this place is incredibly creepy. 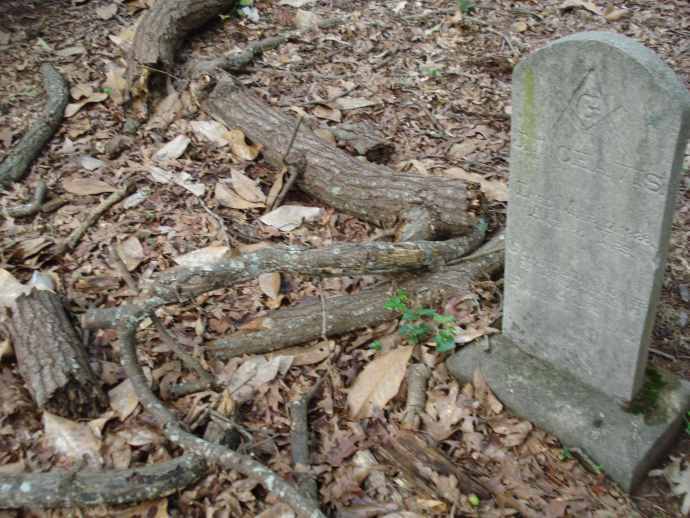 Fallen and broken headstones lay amongst a tragic amount of overgrowth–some, even, are crushed beneath a massive tree branch that no one has bothered to remove. Creepier still are the dozens of unmarked graves. If the ground seems oddly lumpy, like small rolling hills, be careful not to trip–you’re literally falling over someone’s unmarked burial plot. Some graves are even marked, not with a headstone, but with whatever the family members could afford: A plank of wood, a scrap of tin with a name on it, or just a small rock. Oberlin Cemetery has some friends, who volunteer to go clean it up and keep it as fresh and loved as possible. 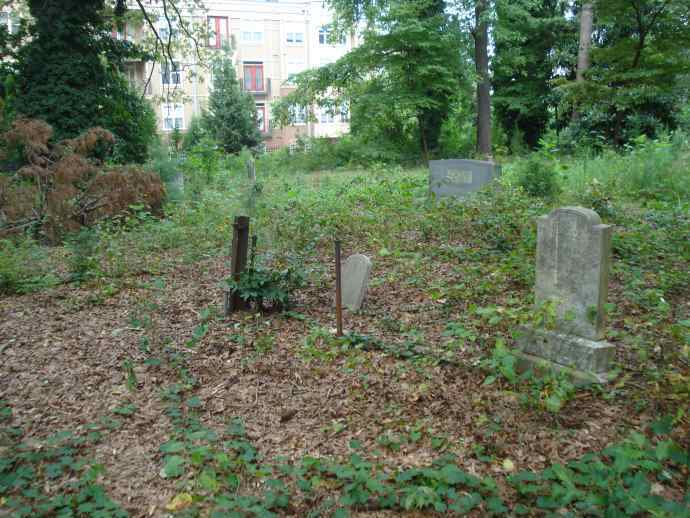 If you’re interested in helping revitalize this neglected resting place to so many deserving citizens, the Friends of Oberlin need funding and volunteer-power. Until then, while it may be getting slightly more press than in decades past, this forgotten relic is still unknown to most Raleigh citizens. Remember that, Raleigh, as you zip into Cameron Village to get a sandwich and a latte–you are walking past the forgotten dead. 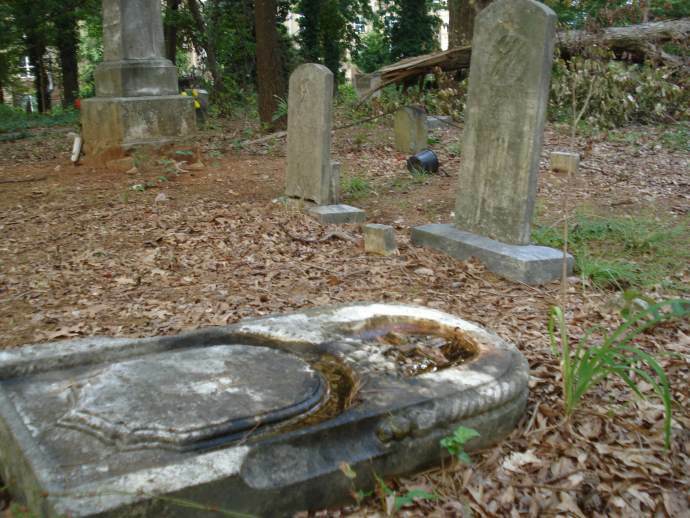 If anyone wants an EXCELLENT historical overview on the Oberlin community and cemetery, including who’s buried there, please refer to the Raleigh Historic Landmark Designation Application for the Oberlin Cemetery.